I often find myself in situations where my clients purchase/inventory/build some types of kits in AX/Dynamics 365 for Finance & Operations. The scenarios could include purchasing the components and building them into a kit that they will then sell, or purchasing a kit that they disassemble and sell the components. Most of these clients are not in the retail industry, for which Microsoft Dynamics AX offers a kitting functionality. 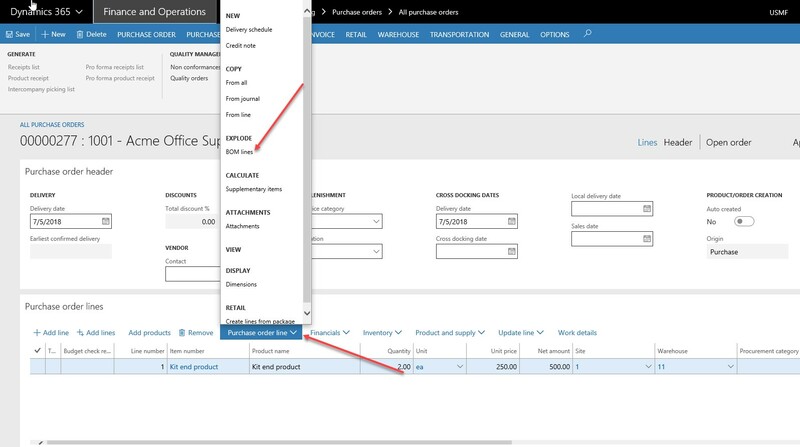 For those who are not using the retail module, the easiest way to handle this in Dynamics 365 for Finance & Operations is with the use of the bill of materials (BOM) and the bill of material journal. 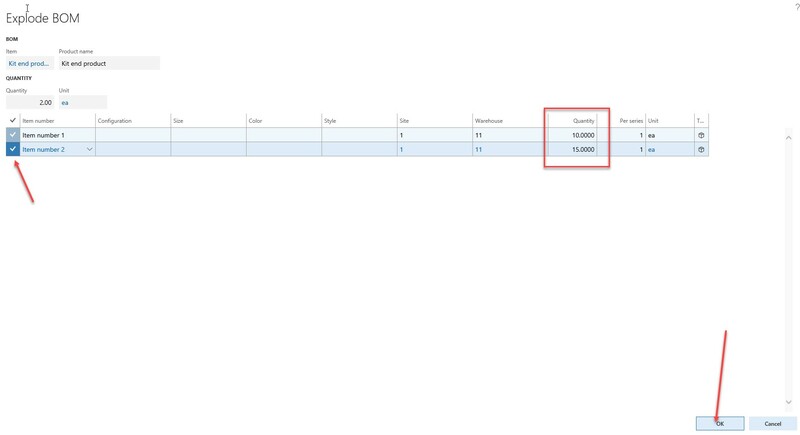 A very useful functionality here is the ‘Explode BOM’ on both the sales order (SO) and the purchase order (PO) lines. This little trick is often forgotten about, however it can be very useful in a number of situations. This blog post describes how BOMs along with the ‘Explode BOM’ functionality on SO and/or PO can be used to purchase and/or sell kits. 1. Create the line for the kit, the BOM, and enter the quantity. 2. Go to purchase order line / Explode / BOM lines. 3. A pop-up form will show you the lines; select the lines and click OK.
4. Note that the kit is still on the PO, indicating to your vendor that you are ordering the kit. However, the quantity field is empty and the appropriate quantities for the component lines are calculated and added. 5. When you receive the PO, you’ll see that the system will receive it into inventory as 20 of Item number 1 and 30 of Item number 2, and nothing for End Item Kit. 6. The exact same explode functionality exists on the sales order. Please note that you can only sell as many kits (End Item Number) as you have on inventory and only as many components as you have on inventory, if you are using this functionality. If you need to convert one into the other, you have the options of using either the BOM journal or playing around with the ‘Explode BOM’ functionality. If building/disassembling is required for the purpose of keeping a record of the actual process, use the BOM journal. You may also decide to use the BOM journal because it is very important that only the relevant information is on the PO/SO. If you want to sell the kit, but only have the components, you may decide to simply put it on the sales order and explode it. This will pull it from inventory component by component, and will appear on the SO and the invoice that you were selling them an End Item Number kit, but it will just list the components. Feel free to contact us if you have any questions about Dynamics 365 for Finance and Operations. We specialize in providing technical assessments, break-fix support, optimization services, and solution expansion projects for Dynamics AX (Dynamics 365 for Finance and Operations).